research & photo shoot venue. Walk through a vast variety of cacti, succulents and cycads. Download our catalogues and choose from over 2000 items. 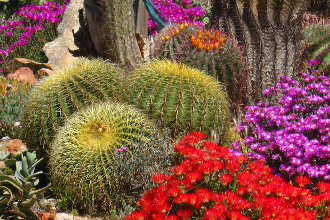 Established in 1954 Sheilam Cactus and Succulent Nursery has been owned and operated by the Schwegmann family since 1967. Located near Robertson, 170 km outside Cape Town, South Africa, and boasting approximately 2000 species of plants, the nursery is recognised by authorities as one of the finest collections of specimen plants. Discover plants such as The Old Man of Peru, Mother-in-Law's-Chair, Horses' Teeth, Elephant Feet, Klipplante (stone plants), Bushman's Grape and lots more! Established in 1954 by Mr L Malherbe who named the farm after his children - Suzan, Helene, Elizabeth, Izak, Louise and Marsha thereby the name SHEILAM. Mr Malherbe was already 70 years old when he started the farm with his collection of old plants. In 1967 the farm was bought by Lloyd and Winnie Schwegmann, Lloyd extended the farm with his personal collection of plants. Since 2003 the farm is owned by Garth and Minette Schwegmann. NB: Nurseries and clients requiring specialist attention, by appointment only. Venue for photo- or fashion shoots - please download our pricelist here. For venue bookings use the contact form or call us.